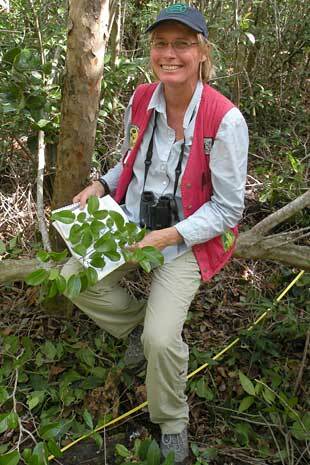 Biogeographer Janet Franklin investigates how species, mostly trees and other plants, are distributed across landscapes. For much of her career this appeared to be a tame scientific inquiry, a mere accounting of how plants naturally fell on an unchanging—or at least, very slowly changing—map. Then everything switched. In the 1980s, computer simulations started suggesting Earth's climate was warming. By the 1990s, evidence of retreating glaciers and increasing global temperatures signaled the models were onto something. Those unchanging maps of species distribution Franklin spent her days mulling over were about to become essential for conservation efforts in the face of climate change. "I remember thinking, 'This is the most important problem of our time; my research has to address it.' And now it does," explains the 57-year-old Franklin, who was named a Fellow of AAAS last year. According to Franklin and others' work, plant communities will gradually flee the newer, warmer temperatures resulting from growing emissions of carbon dioxide (CO2) and other greenhouse gases. In the Northern Hemisphere this means plants, via their seeds, will slowly trudge northward to higher latitudes and upward to higher altitudes to find cooler environs that more closely resemble the conditions under which they evolved. However, this is just the simple explanation. Franklin's work has added further complexity to our understanding of how climate change is affecting ecological change. It's something her career has made her uniquely qualified to do. Franklin's first foray with what would become her life's passion came in the early 1980s when she was a graduate student at UC Santa Barbara, where she was studying plant ecology. At the time, a geography professor needed a student worker who could tell the difference between various species of pine trees by looking at aerial photographs. Franklin could do that. She was hired and soon found herself working in remote sensing. "It was this new and exciting field at the time, something to be involved in and learn about from the ground floor," says Franklin. Starting as land surveys taken from airplanes and later satellites, remote sensing provides much of the data that feed the current models simulating how species are expected to migrate under climate change. In many ways remote sensing is the intellectual precursor to the type of work Franklin is now doing. To understand how, we need only look at the evolution of Franklin's expertise . Looking at aerial maps in an attempt to better determine what species of tree fell where on the map, Franklin and other innovators in the new field started developing a series of simple rules. For example, if two tree species were all but identical from the photographs, but it was known that one tree grew at higher elevations than the other, researchers could determine the tree species by comparing the photos to elevations. Since then Franklin's work has gotten exceedingly more complex, but that's the way she likes it. "I love complexity. I've always loved puzzles," she says. Climatic change's effects on plant communities are expected to be complex, and, according to Franklin, many of the time-honored tools of her field will need considerable revamping in order to capture that complexity, including her specialty, species distribution models. "Models that say the climate is getting warmer so plants either have to move north or go uphill ignore the subtleties," says Franklin. Franklin's work has been about adding these subtleties. For the past several decades, she has been at the forefront of advancing the research techniques of biogeography, effectively overhauling species distribution modeling. The result is a kind of digital toolkit made of computer simulations that can juggle the ecological implications of multiple climatic scenarios (to what extent humans will continue dumping CO2 into the atmosphere thereby contributing to more warming). When taken together, the simulations allow users—from research scientist to resource manager—to visualize how plants are expected to respond as well as what humans might do to adapt. But for this to work, the simulations need to include complex ecological maps. This is where Franklin's current research enters the picture. Many computer simulations of plant migrations under climate change model ultra-simplified landscapes. For instance, in many climate models, the mountains of the West appear as a kind of sloping, generalized plateau, lacking the intricacy of most topographic maps. But biologists have long known that complex mountain topography can harbor microhabitats in valleys and on certain slopes that don't reflect the more generalized climatic conditions around them. "In mountainous areas topography actually moderates the climate quite a bit," notes Franklin. Not accounting for these microhabitats, says Franklin, is leading in some cases to an overestimation of climate impacts on biological communities. Ultimately, she wants to discover through complexity previously overlooked, possibilities for adapting to climate change. "Species might be able to exist in microhabitats longer than you might expect from large scale climate change."